As a healthcare professional, you’ve made a commitment to do no harm. The expectations that come with that promise are clear when it comes to helping a patient’s physical well-being, but what about their financial well-being? Paying medical bills is a challenge for many patients, and collecting on those payments is a challenge for many hospitals and healthcare centers as well. With the Epic River Patient Lending solution, you can ease the process for everyone. 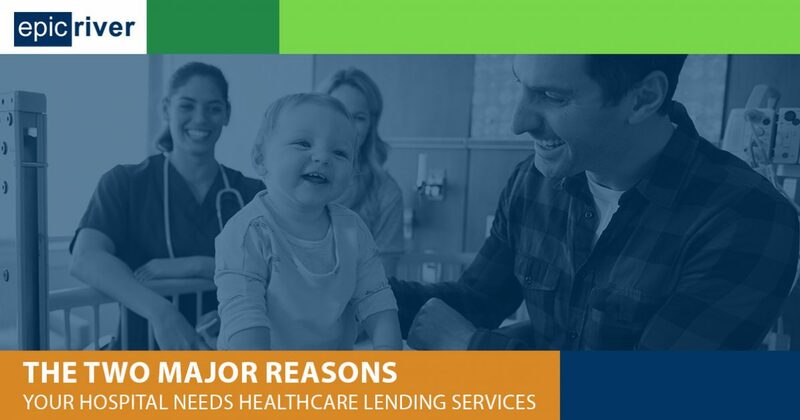 Read on to learn the two biggest reasons why your hospital should choose the Epic River Patient Lending solution and contact our team today to get started! Healthcare costs can be complicated — and numerous. Patients have to worry about deductibles, co-insurance, and whether or not procedures or clinicians are covered under their health insurance at all. As we have discussed in previous blogs, the numbers and statistics surrounding medical bills are not encouraging. Millions of Americans are struggling with debt accrued by healthcare costs – one in four Americans under 65 have medical debt – and studies find that a high percentage of patients choose to postpone or neglect medical care because of the financial strain. Here at Epic River, we believe that patients shouldn’t have to accept a lower quality of life because of the cost of care, and our patient financial services make staying physically and fiscally healthier easier than ever. Paying large bills upfront is difficult or impossible for many, and finding a low-interest medical loan can often be just as challenging. Epic River connects hospitals and healthcare centers to local financial institutions to close the gap between treatment and payment. Every patient qualifies, regardless of citizenship or financial status, and they can take advantage of fair, unchanging interest rates to make monthly payments in an amount that works for their budget. Everyone at your hospital works hard to improve each and every patient’s life. You apply your time, skill, and effort to address every problem. If patients can’t pay their bills, however, it can be hard to get fair and accurate compensation. With Patient Lending from Epic River, billing professionals can enjoy a simplified collections process to ensure both the hospital and its staff get paid for their efforts. Epic River can provide our innovative, customer-friendly Patient Lending platform to your hospital or healthcare center at no cost to you. The way it works is simple: we connect your patients to competitive rates and simple repayment solutions through a local partner bank or credit union. Once a patient signs up for a loan, your hospital receives payment up front and in full. You and your staff don’t have to worry about billing or payment processing – the bank will handle everything – and Epic River offers a secure online network so you don’t even have to worry about downloading local software. Start Working with Epic River Today! Partner with Epic River and make medical billing easier for everyone. We make it possible for patients to afford the healthcare they deserve and hospitals to receive fast and fair compensation. Explore our site today to learn more about our patient lending program and our convenient, confidential systems like Finastra ProSign® for simple document sharing and verified eSignature service. Ready to get started? Contact Epic River today!